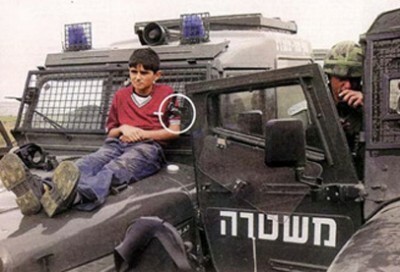 Image: Palestinian child used as human shield by the Israeli army a few years ago. For five days during Israel’s recent assault on Gaza, 16-year old Ahmad Abu-Raida says he was held by Israeli soldiers as a human shield. Repeatedly beaten by the unit that seized him, the youngster describes being forced at gunpoint to enter deserted homes, which could have been booby-trapped, to search for Hamas tunnels. Ahmad’s account, taken by Defence for Children International, is one of five allegations of criminal conduct that the Israeli army announced last week it would be investigating. More than 99 incidents have so far been highlighted by Israel’s military attorney general. Taking Ahmad as a hostage and using him as a human shield would constitute a grave violation of the Geneva Conventions, the rules of war intended to protect non-combatants. It would also violate a 2005 decision by Israel’s highest court, outlawing what had until then appeared to be a routine practice, known as the “neighbour procedure,” used by the Israeli army. Ahmad’s experiences and several other suspected war crimes being investigated by the Israeli military made headlines in the international media during and immediately after the seven weeks of fighting. That has added to the pressure on Israel to be seen to be taking the allegations seriously. An Israeli air force missile strike on a beach on 18 July that killed four children playing football, an incident widely reported because it occurred in full view of journalists staying in a nearby hotel. An Israeli strike on a United Nations-run school in Beit Hanoun on 24 July that killed 15 Palestinian civilians sheltering there and wounded scores more. The shooting of a woman as she left her home after her exit from a conflict zone had been coordinated with the Israeli army. The theft of money by a soldier from a home, reported by his commander. These incidents cover only a fraction of the more than 2,100 Palestinians killed during 50 days of Israel’s operation in Gaza dubbed “Protective Edge.” Some three-quarters of the dead are reported to be civilians, including more than 500 children. Another 11,000 were wounded, and more than 100,000 are estimated to be homeless. The speed with which the army’s investigations have been launched reflects the new political and legal environment in which Israel finds itself. Unlike the situation following Israel’s earlier operation, Cast Lead, in winter 2008-09 – when more than 1,400 Palestinians were killed, again a majority of them civilians – the Palestinians now have a status similar to statehood at the United Nations. That entitles the Palestinian leadership under Mahmoud Abbas to sign the Rome Statute, allowing it to refer Israel to the International Criminal Court (ICC) at the Hague for war crimes investigations. So far, the indications are that Abbas is actively avoiding such a step, apparently worried that it would lead to severe retaliation from Israel and the United States. Instead, he has sought to use the threat of an ICC application to leverage further peace talks from Israel. However, Abbas is facing strong pressure from within his own Fatah party’s ranks, and has been isolated by Hamas’ announcement that it supports joining the ICC, even if it risks coming under scrutiny from the Hague body too. At the weekend, a group of 15 leading Palestinian lawyers convened to prepare a dossier of Israeli war crimes in Gaza in what they billed as an effort to bring the allegations to the ICC. Based on previous experience, warn critics, Israel’s own investigations are unlikely to be conducted in good faith. They accuse Israel of “going through the motions” to fend off efforts by outside bodies, especially the Hague court, to probe events in Gaza. “There has to be more than a suspicion that Israel is carrying out these investigations simply to shield its military commanders from legal accountability,” Hala Khoury-Bisharat, an international law professor at Carmel Academic College, near Haifa, told Middle East Eye. That is because the ICC would be ineligible to examine war crimes allegations unless it could be shown that Israel had failed to carry out credible investigations itself. Israel is facing rival inquiries on several fronts, all of which are likely to reach highly critical conclusions. The most noted and high profile is a commission of inquiry established by the United Human Rights Council, and led by Canadian jurist William Schabas. Its findings are not likely to be made public for many months. The UN secretary general, Ban Ki-moon, may approve a separate inquiry into Israel’s attacks on three of its schools in Gaza, in which at least 45 people were killed. However, it would only begin its work after the Schabas committee reports. In parallel, the two largest international human rights groups, Human Rights Watch and Amnesty International, are also investigating. Last week, a day after the army announced its own inquiries, HRW published the findings of a probe into the strikes on the three UN-run schools, accusing the Israeli army of war crimes. The report observed that the schools were well marked, the coordinates of their location had been passed to Israel, and the army knew hundreds of civilians were taking shelter in each. Notably, Israel has tried to stifle the work of HRW and Amnesty by blocking their staff from entering Gaza to conduct research. Israel has also indicated it will not cooperate with the Schabas committee. In addition, Israel has to contend with Israeli and Palestinian human rights groups, which are currently conducting fact-finding research. On this occasion, however, they are split over how to respond to the Israeli military’s investigations. All are agreed that the army is incapable of investigating itself fairly, and that, based on past form, Israel will at best convict a few individuals for relatively minor offences. After much delay following Israel’s 2009 attack on Gaza, Israel punished only four soldiers. The harshest sentence was seven months for stealing a credit card. This was despite a UN fact-finding commission led by a respected South African jurist, Richard Goldstone, concluding that there were strong suspicions that the Israeli military and Hamas had committed war crimes. In a statement last week, B’Tselem and Yesh Din, two of Israel’s best-known human rights organisations operating in the occupied Palestinian territories, said that for the first time they were refusing to provide information and testimonies to the military authorities. Accusing the army of preparing a “whitewash,” B’Tselem called for “the establishment of an effective, transparent and impartial mechanism” to investigate Israel’s conduct. B’Tselem and Yesh Din pointed out that the Israeli authorities had not even implemented the limited reforms to Israel’s investigation process recommended last year by a former Israeli supreme court judge, Jacob Turkel. Israel’s human rights community is still bruised from its experiences after 2009’s Cast Lead, when groups close to the government launched a campaign vilifying not only Goldstone but human rights organisations like B’Tselem for assisting him. In recent years, the government of Benjamin Netanyahu has also repeatedly pondered legislative initiatives to limit the funding of Israeli human rights groups, effectively bankrupting them. However, the Adalah legal centre for the Arab minority in Israel said it would continue referring allegations of war crimes to the Israeli military, if only to demonstrate that the investigations lacked credibility, transparency and effectiveness. Adalah has sent letters of complaint concerning more than 20 major incidents in Gaza, including two that have already been dismissed by Israeli investigators. These concern an air strike on the al-Kaware home in Khan Yunis on 8 July, the opening day of Israel’s attack, that killed eight members of the family, and a strike the next day on a vehicle that killed a Palestinian journalist. “In the case of the Kaware family, the Israeli investigators argued that the missile could not be diverted in time, an explanation that is irrelevant to whether this attack constituted a war crime,” Zaher said. A deeper problem with Israel’s approach, say critics in the human rights community, is that its investigations completely ignore the legality of the military operation’s aims and the army’s strategies, instead concentrating on the behaviour of a few soldiers. Israel’s hostility to subjecting its wider military strategy to scrutiny should be understood in the context of its efforts over the past six years to win recognition from the US and Europe for its reinterpretations of the rules of war. Israel’s opening attack in Cast Lead on a police passing out ceremony, which killed 89 recruits, was in flagrant breach of both principles, said Khoury-Bisharat. Haaretz found Israeli lawyers had intensively debated how they could reclassify as combatants those who, like the policemen, were either not actively engaged in combat or not military targets at the time of the attack. One cited in his testimony the air strike on the policemen, calling it “wrong” and observing that it took priority over attacks on suspected rocket and weapons caches. Instead, Israel has developed a conceptual discourse that implicitly distinguishes between a “civilian” and a new category, broadly defined, of a “militant” or “terrorist.” Israel has thereby been able to classify all members of Hamas as potential military targets, including the political leadership. This new distinction has also sought to legitimise strikes on the homes of Hamas leaders. On 20 August, Israel hit the home of Mohammed Deif, apparently when he was not there, killing his wife and seven-month-old son. Critics point out that Israel’s interpretation, if accepted, would entitle groups like Hamas or Hezbollah in Lebanon to target the homes of Israeli reserve soldiers or soldiers off duty with their family. Similarly, Israel used “massive fire” over a large area of Rafah on 1 August, reportedly killing more than 100 Palestinians, to try to foil Hamas capturing alive an Israeli soldier through one of its tunnels. The shelling was conducted under the “Hannibal procedure,” designed to prevent a soldier becoming a bargaining chip. Khoury-Bisharat said, according to international humanitarian law, it was impossible to justify so many civilian deaths simply to prevent a soldier being taken prisoner. However, Israel is facing a new and possibly unexpected problem in its investigations of Operation Protective Edge, one created by the effectiveness of its missile defence system known as Iron Dome. The system is reported to have shot down most rockets fired from Gaza that threatened Israeli population centres, limiting the civilian death toll to five Israelis and one Thai worker. According to a leading Israeli think-tank, the Democracy Institute, that could dramatically alter Israel’s legal justifications for using armed force if Palestinian civilians are likely to be hurt or killed. That would kick one leg from under Israel’s claim that the high death toll of Palestinian civilians reflected a Hamas policy of hiding among the civilian population. Khoury-Bisharat said she found that argument problematic.